BELIZE CITY, Mon. Feb. 9 2015–Verdes FC is the only team with a perfect (2-0) record at Week 2 of the Premier League of Belize (PLB) 2014-2015 Closing Season, with only 1 game, Saturday night’s, producing a draw this past weekend, while 3 others on Sunday ended in decisive victory margins. In the only Saturday night game, at the Isidoro Beaton Stadium in Belmopan, home standing Police United FC led 3-2 late in second half until the veteran Norman “Tilliman” Nunez unleashed a right foot blast from 25 yards out that tightened the net in the left pigeon hole to knot things up at 3-3 for his visiting Placencia Texmar Assassins. After two early take-downs inside the Police eighteen, referee Amir Castillas signaled the penalty spot, and Placencia’s Luis “Baaka” Torres drilled it to the left of Keith Allen, who got only a finger tip on it. But Police came roaring back a few minutes later, as Devon Makin’s center from the right side saw advancing Harrison “Cafu” Roches in perfect position for the close range side-volley, to tie the score at 1 apiece. Police took the lead early in second half, when Byron Usher drained a center from the right side over the head of Placencia goalie Jesus Urbina, and the ball promptly sank into the left corner of the net; 2-1, Police in front. Placencia equalized just over ten minutes later, when Dellone Torres drove the right side and his attempt came back out to teammate Ashley Torres, who wasted no time in driving a hard right foot shot over the outstretched hands of Allen to tie the score again at 2-2. When Assassins coach Hilly Muschamp inserted the veteran Tilliman into the game at the 67th minute to replace Bernard “Hijo” Linares, he calculated to give up some defensive posture in favor of a more aggressive attack, as he instructed Tilliman to go up into the forward line. Tilliman has been playing a lot of midfield in these latter days, and some fans questioned the wisdom of sending the veteran into the tough rumble inside the Police defensive area. The move seemed to backfire, as about ten minutes later, Police struck again at the other end, when Jason “Pack Bread” Kelly, who had replaced Brent Whyte on the left defence for Placencia, was still adjusting to the pace of speedy Police right midfielder Devon Makin, who gained a step along the right side, and sent a cross to the head of Cafu, who headed it to Clifton West, who headed the ball past Urbina, to give Police the lead again, 3-2. Lennox “Criminal” Castillo had rejuvenated the Police offense, replacing Marlon Meza, (both teams played 3 forward for most of the game), and it looked like they had the notion to get an insurance goal, while Placencia was desperately trying for another equalizer. With coach Hilly exhorting Tilliman to go up higher into the forward line, that was the setting when Placencia’s Dellone Torres went deep down the right line and centered back towards an advancing Tilliman about ten yards behind the Police eighteen yard line. As Police defenders closed in, Tilliman touched the ball once with his left foot, maybe twice to cool it down going forward, and, while most were expecting a pass from that long distance, he unleashed a right foot missile that was still rising when it tightened the left top corner of the net, before a bewildered Keith Allen could even think of jumping. It was an absolutely phenomenal shot, remarkable under any circumstances, and by any player, youth or veteran. It is a pity that referee Amir Castillas felt he had to employ the letter of the law and give Tilliman a yellow card for lifting just the front portion of his shirt, not even above his face, in his moment of jubilation. Tilliman fan number one, Gilroy “Press” Cadogan remarked after the game that Tilliman is making history, as the only player to be scoring goals inside the last four decades – the 80’s, 90’s 2000’s, and now in the 2010+ years. Tilliman will be 44 in June of this year. Amazing, indeed! 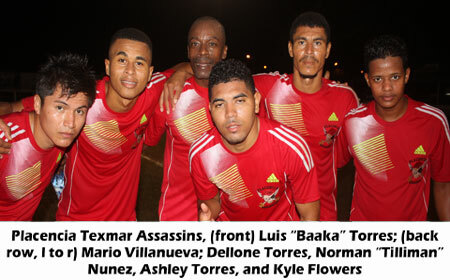 Goal scorers for Police were Harrison “Cafu” Roches (15’), Byron “Barrow” Usher (49’) and Clifton West (73’); while hitting the target for the Assassins were Luis “Baaka” Torres (12’ PK), Ashley Torres (63’) and Norman “Tilliman” Nunez (87’). On Sunday, at the Carl Ramos Stadium in Dangriga, it was BDF, 3-1, over visiting King Energy/Freedom Fighters from Punta Gorda. Shaking the net for BDF were Osmar Duran (19’), Carlton “Fubu” Thomas (39’) and James Flores (62’); while the lone tally for the Freedom Fighters came in injury time from Derrol Lambey (90+’). Meanwhile, at the Isidoro Beaton Stadium in Belmopan, defending champions Belmopan Bandits were held scoreless in first half by visiting Wagiya from Dangriga, but the Bandits’ Ghanaian import, 21-year-old Jehoshaphat Nnadi (51’) broke the ice early in second half for the Bandits, and young Highking Roberts added 2 more (90+’ & 90+’) in injury time to seal the 3-0 victory for the Bandits. Also on Sunday, out west at the Norman Broaster Stadium in San Ignacio, Verdes FC gave their fans a real treat, as they jumped to an early lead and secured a comfortable 3-0 victory over visiting FC Belize, to maintain their top position in the standings. Hitting the target for Verdes were Alcides Thomas (1’), Ricardo “Cheety” Jimenez (7’) and Jarret Davis (86’).